Click that beastie to enlarge, it's huge! Unlike the proceeding event Heroes Reborn, Heroes Return was a revamp of an ongoing nature - and what a nature it heralded! Waid and Garney back on Captain America, George Perez and Kurt Busiek on The Avengers, and Allan Davis on Fantastic Four! Yeah, I was pumped. The return was definitely worth the heroes being reborn in the first place. As for this poster (from an issue of Marvel Vision), at one point I could almost redraw it in my sleep (except I'd draw Archangel where Magneto/Joseph flies). What made it even cooler than Carlos's art usually is, was the fact Daredevil, Zabu and Ka-Zar made the line-up - these guys hardly get included in anything! How the three of them and half of the others fly is probably due to Storm or Thor's wind (resists childish giggle), but of all the ways the Daily Bugle sign has bit the dust, this has to be one of the best looking ever. That is a stunning piece of work, and I think that's one of the best looking Thor's I've ever seen. Thank you so much for posting this, Dan. I really rated Carlos's work on Fantastic Four...he stayed far longer on the book than was originally intended and is much understated. He had a unique line in drawing his figures centre-stage with the colourist collaborating with him doing primary colours, whilst the background was suitably muted. Nothing was ever too empty or too cluttered for him and his heroes fairly 'popped' out. He was also one of those rare artists who didnt follow the 'Marvel Method' and drew panels his way...his FF run featuring Annihulus was suitably alien and bizarre. My favourite FF run was his Generals of Doom, where Doom had three villains from counter-earth fighting the FF. I loved his version of Lady Dorma, counter-earths version of Sub-Mariner! Occasionally his own style of art clashed with Chris Claremonts over-embellished dialogue, and it would have to be shrunk to accomodate it sadly. 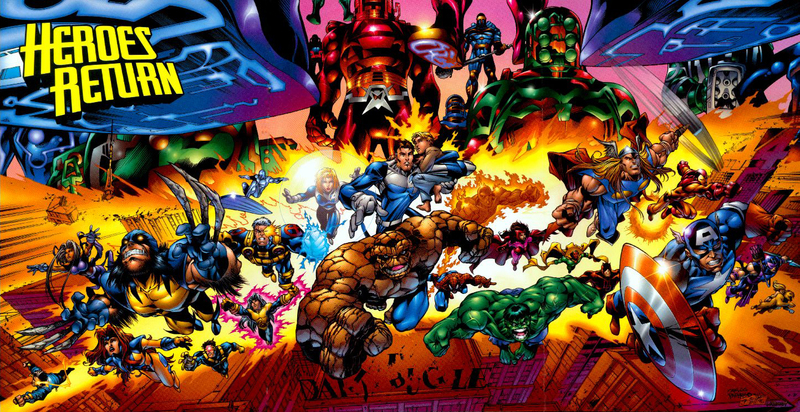 I first came across his work on the final two issues of FF before the Heroes Reborn run, then again during Heroes Return which featured some lush colouring and the Eternals. This above pic I recall very well. I so used to get Marvel Vision - that wafer-thin eight-page leaflet which was so useful [not] in the days before we got the internet. Karl, I think every time Carlos picked or picks up the pencil he is under-rated and agree completely. he has been one of the proven backbones of the industry for so long. I dug his Inisible Woman and Namor, and he had a pretty unique take on the Human Torch too. Marvel Vision I loved for one thing - Timeslide. 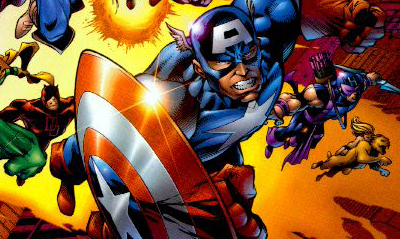 I wish those revamps would come back, maybe in the back pages of the modern Marvel comics! Carlos Pachecho, Larocca and Art Thibert...all three are genuises when their work is put together. I really like this poster! I saw this picture before and I was looking for a big version of this several years ago. Hey David - thanks for dropping by! I too struggled to find a big version without staple holes in it. 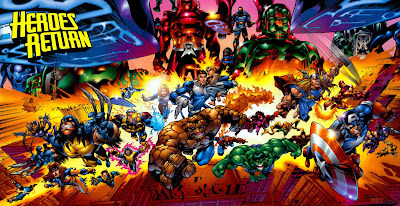 Then I found my old Marvel Vision's which I thought I'd buffed and 'boom' the click to enlarge version above was born!